When you add up all of the human resources required to design and execute a marketing campaign, you are looking at potentially hundreds of working hours. In addition to this, you have the direct costs of development and launching the campaign. Of course, neither of these measurements takes into consideration any peripheral costs. Ultimately, you will have to justify these costs. After all, the C-Suite tend to want to see value when they allocate company funds. In order to provide this justification, the marketing team must be able to show concrete metrics demonstrating the effectiveness of each marketing campaign that is launched. In order to make this happen, data must be collected that can be used to determine whether or not the campaign has “earned it keep”. Every marketing campaign is different, thus the metrics used to determine its success will vary slightly. There are, however a few metrics that offer a very reliable view of the success, or lack thereof, of a marketing campaign. The following six metrics are excellent ways to determine whether or not a marketing campaign has had the impact that the marketing team desires. Your page view count is a tally of number of pages within your website that visitors click. If creating Web page content is a part of your marketing campaign, your page view count is a great way to determine whether or not that content is successful. If you page views jump during a marketing campaign, this is a good sign. It means that visitors are reading your content, and becoming engaged enough that they are navigating within your website to learn more. It doesn't, of course, tell the whole story though. Unlike your page view count, you want this number to be low. A bounce is counted against your website when somebody enters your website and then leaves immediately. This is an indication that something on your landing page or homepage is repelling visitors, something on the back-end is slowing down the experience or visitors enter your website expecting something different than what they are receiving. The latter could be a result of confusing advertising. High bounce rates are problematic as they lower your SEO rankings. Then, there is the obvious fact that users who bounce are not going to convert. This is really the ultimate test of the effectiveness of your marketing campaign. Conversion rate is the number of customers who are answering your call to action (CTA). These are the customers who are making purchases, subscribing to your blog, filling out a form, sharing your posts, joining your hashtag marketing campaign or following you on social media. Whatever your call to action is in your marketing campaign, any customer who heeds it adds to your conversion rate. Whether or not you consider your conversion rate to be an indicator of success or failure depends on the details of your marketing campaign. If you are tracking a simple social media campaign, even a few additional conversions is a positive thing. On the other hand, if you have invested in Web advertising, building landing pages, and creating a lot of content you'll want your conversions to increase significantly. Not only are inbound links a great metric to watch, they are also a bit of a compliment. If another blogger or website administrator finds your content, products or services valuable enough that they include a link to one of your Web pages in their content, that is an inbound link. The reason that this is a big deal is that inbound links are essentially offers of encouragement for their visitors to leave their website and come to yours. These are difficult to come by. This is the number of visits you receive from users who find your website or blog in search engine results pages. If the content you have created for your marketing campaign is optimized, these numbers will increase during your campaign. If not, they will remain stagnant, or worse, they will drop. If you do not see an increase in search engine traffic, it is probably best to review your content and make any changes required to improve optimization. This is the amount of money that you have had to invest to get each customer to convert. To calculate this amount, you have to determine the amount of money spent on the marketing campaign within a set period of time. Then, you divide that dollar amount by the total number of customers who have converted within that same period of time. 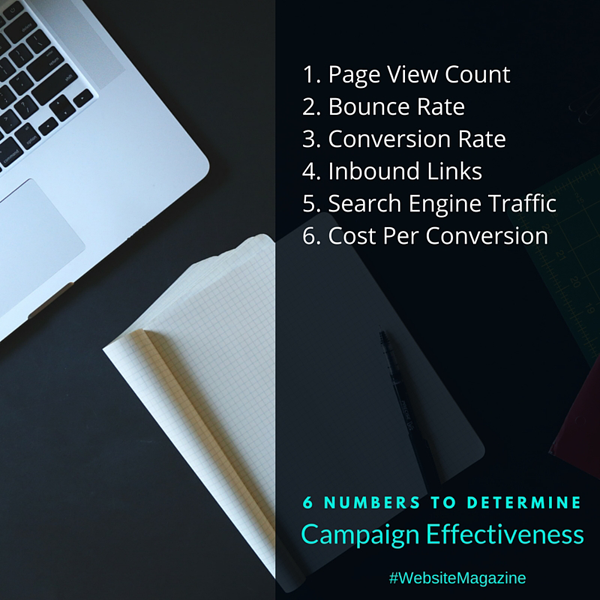 The result is your cost per conversion. Ideally, that number is as low as possible. However, that number should also be balanced with the value of each conversion. If your CTA involves making a purchase of several thousand dollars, that conversion is more valuable than a CTA that simply asks customers to subscribe to a newsletter. John Unger is a professional writer and blogger from Manchester, UK covering business and marketing in hopes of inspiring and informing readers. You can find more articles on John's educational blog or get in touch with him via Twitter or Google+.